Read More Sayed Haider Raza's themes were drawn from his childhood memories spent in the forests of his native village of Babaria, in Madhya Pradesh. Raza's style evolved over the years - he began with expressionist landscapes, which became rigid, geometric representations of French towns and villages in the early 1950s, following his move to Paris. Later, the lines blurred and colour began to dominate; his theme was still landscape but it was now non-representational, speaking to the sentiment evoked by a place rather than its tangible aspects. 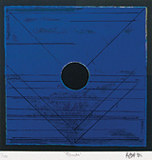 In the late 1970s, the artist's focus turned to pure geometrical forms; his images were improvisations on an essential theme: that of the mapping out of a metaphorical space in the mind. 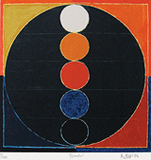 In the 1980s, the circle or "Bindu" became the central motif. Sacred in its symbolism, it placed his work in an Indian context. 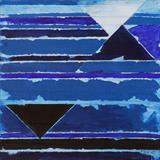 The artist calls his work from the 1980s onwards a "result of two parallel enquiries." Firstly, it is aimed at a "pure plastic order" and secondly, it concerns the theme of nature. Both converge into a single point and become inseparable - the "Bindu" (the dot or the epicentre). "The Bindu symbolizes the seed, bearing the potential of all life." 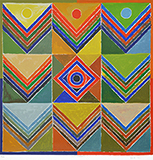 Raza was one of the founders of the Progressive Artists' Group, along with K H Ara and F N Souza. After receiving a French Government Scholarship in 1950, he left for Ecole Nationale des Beaux-Arts, Paris. Raza was awarded the Prix de la Critique in Paris in 1956. In 1962 he served as a visiting lecturer at the University of California in Berkeley, USA. 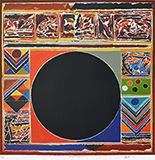 He participated in numerous exhibitions, including the Sao Paulo Biennale in 1958; the Biennale de Menton, in France in 1966; 1968 and in 1978; Contemporary Indian Painting at the Royal Academy in London, in 1982; Roopankar Museum of Fine Arts, Bharat Bhavan, Bhopal; Jehangir Art Gallery, Mumbai; National Gallery of Modern Art, New Delhi, in 1997; Celebrating 85 Years of Living Legend S H Raza, a travelling exhibition at Hong Kong, Singapore, Dubai, Mumbai, New Delhi organised by Aryan Art Gallery, New Delhi, and Raza – A Retrospective, Saffronart, New York in association with Berkeley Square Gallery, in 2007; Paysage: Select Works 1950s-1970s, Sovereign FZE, Dubai, in 2014; and Nirantar, Vadehra Art Gallery, New Delhi and Art Musings, Mumbai, in 2016. He was conferred the Padma Shree Award by the President of India in 1981, and the Padma Bhushan in 2007. 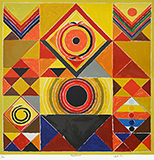 1997 Roopankar Museum of Fine Arts, Bharat Bhavan, Bhopal; Jehangir Art Gallery, Mumbai; National Gallery of Modern Art, Delhi. 2000 Arthur M. Sackler Gallery and Smithsonian Freer Gallery of Art, Smithsonian Institute, Washington D.C. Taking a brief break from his painting and the constant stream of visitors that come to see him in his Gorbio studio, Sayed Haider Raza spent a summer morning in 2007 in conversation with Saffronart about his recent work, and the long journey it has taken to reach this point in his career. What were the various paths that led you to your present geometric meditations on nature and its elements? Can you also talk a little bit about your creative process today, and the ways in which it has evolved over the years? Yes, you know, it is a very difficult thing for a painter to talk about his art. But I feel that sometimes certain expressions are necessary because unfortunately, very often, invariably, journalists talk about not really the important things which concern creativity in painting or art and the expression of spirituality that artists or poets have. They talk about certain, very secondary things. Now, very briefly, I would say that this 'research' of mine over the past almost sixty years has been a long journey from Madhya Pradesh, Central India - Damoh, Mandla, Narsinghpur, Narmada - to Nagpur, then to Bombay, and as a young man of twenty, twenty five, thirty years, I was searching. In 1947 India became independent and we were immensely happy. We wanted to take our destiny in our hands, not only as Indians. As painters. As thinkers. As people involved in 'artistic research'. There was very little of this 'research' in India apart from the contribution which I must say has been made by the Bengal artists in the beginning of the twentieth century - painters like Nandalal Bose, Asit Kumar Haldar, Abanindranath Tagore and many others who have contributed to the 'research' of Indian painting in a traditional way, and Jamini Roy and the poet Tagore [Rabindranath] in a vital modern way. We as young painters were drawn towards Bengal because they brought to our notice the importance of tradition in painting, whereas in the schools we were learning European art - painting and drawing from models, Greek and Roman, and following the European way of the 'world seen by the retina' or the eyes, as opposed to the concept of antar jyoti or antar gyan, the third eye in India which was important to us, which both in Bengal and in Gujarat the painters of the nineteenth century and early twentieth century drew our attention to. I personally was very happy and grateful; I even had one simple and acute ambition to come to Shantniketan for studies. I couldn't make it - I could only go to Nagpur and then later to Bombay with the help of the scholarships that were given to me. And I worked - first in Nagpur in 1940-41 and then in Bombay between 1942 and 1950. I had another ambition then - to see French art; to visit Europe and find a vital center of art where I could live and work and think. You see, very briefly, I would say that Indian music, dance, and culture were on the minds of Europeans, but not Indian painting. 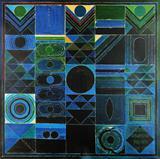 It was a miracle that Amrita Shergill emerged as a modern painter in the 1930's and 40's. Alas she died very young in India. We were very unhappy, but she inspired us to inquire and find out - What is art? What is Indian culture? What is life? And so I decided to come to France where I was attracted by the paintings of C?zanne, Gauguin, van Gogh and other French painters. Souza went over to London and Samant went to New York. Now, you see, the thing was that we wanted to take the bull by the horns. We wanted to see what is what, and it was not a small story - I needed ten years in Bombay and I needed thirty years here to understand what is 'plastic art', what the fundamental requirements of a 'vital painted work' were so that it could be called important. I did this in France, in Paris, and I am grateful that my wife Janine Mongillat participated, and that I could come to a certain recognition in the art world in France and the rest of the world. But I was still unhappy. I said to myself: Yes, it is alright to be an important painter of the Ecole de Paris, but where is your Indian background Raza? I asked myself. And I started coming more and more regularly to India - for two to three months every year to study again what Indian culture was, what Indian sculpture was. I went to Ellora and Ajanta, I went to Benares, I went to Gujarat and Rajasthan. I looked at the sculptures and paintings, I read books, and still I needed another twenty years to arrive where I am today. You know, it's not very easy to give fifty years of one's life to the 'fundamental research' of painting. It was a long period, a long wait, but I did it. And these two periods are very important - the first period between 1940 and 1970/75, and the second between 1975/80 and 2000, where I brought Indian ethnography, Indian concepts into vital painted works. And today, happily, for the last three years alone I am seeing the results and recognition of this work in the international arena. My paintings are well received in New York, in Tokyo, Singapore, India, France, and everywhere else. Today, I am working in spite of bad health at the age of almost eighty six in the South of France, where I am painting Maha Bharat. Can you imagine - I didn't put it as one word [like the epic], but as two, meaning 'India the Great'. I am proud of my country though I am very grateful to France and to my French wife Janine, who assisted me in understanding what art is, and also gave me an insight into religious Christian thought. I pray to Ganeshji and Shiva, I go to a mosque, I go to a synagogue, and I go to a church. I feel that divine power is extremely important and somehow it creeps in even in my works. I have done paintings where I have inscribed 'Yatra naryast poojyante ramantra tatva devita', a Sanskrit shloka [saying] meaning 'a house where woman is respected and adored, God's dwell'. I have done other paintings where Hindi or Sanskrit shlokas are present, and these are being shown at the moment at a chateau in Gorbio, where I am, for the last three months. They have been very well received - people have been coming from all over the world to this little village. You see, it is not even like Kakiya in Madhya Pradesh [the hamlet of seven houses where the artist was born], and people are still coming. [In Hindi] It's by God's blessing, and I am so happy, that all this could be achieved in one short lifetime. I have not forgotten my language, I have created and maintained the relationship of a lifelong-resident with India. People forget. I go to Poona and visit the shrine of Saint Dnyaneshwar. I meet the artists who work there and ask them about Marathi sayings that are attributed to the Saint and his family. [In English] Now, you see, the essence of the story is that I have never left India. I love my country, I am proud of it, and it's not only sentimental my friend. Don't think that it's only emotional. I have been linked up with the profound spiritual, religious message that India has to give to Indians and to the world of which we are forgetful at times, even in India. Still, the world is slowly recognizing the importance of Indian culture, which is immense, but also of contemporary Indian art. 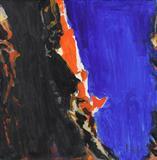 Today, Indian painters are received well all over the world. The young painters from Central India are being presented in Germany and America and other places in a very successful manner and so are the painters of my generation, like Gaitonde, Husain, Tyeb Mehta, Ram Kumar and others. I think we have to take the 'research' further, however, and do important work instead of being interested in superficial things - money, fame and success. We have to work for a pure, fundamental 'research' in art and poetry and music. But I am being too long winded! Do convey the message, though, because I feel that sometimes the painter has to pride his art [in terms of the creative process rather than its material results]. They talk about the prices of my paintings in New York - I am happy about that. I am not neglecting the logic of economics. But let them also say that Raza is a colorist, let them say he has brought in a pictorial art expression of what is important in the last ten centuries of Indian culture. I am painting Nagas, I am painting Kundalini, I am painting the Prakriti Purush concept of male and female. 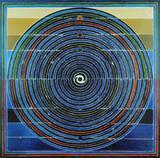 These things have rarely been brought in a vital pictorial way in contemporary Indian art. Some of us are doing it - I am trying to do my best. As a 'messenger' of Indian spirituality, and everything else the country has to offer its people and the world, you turned to 'significant form' through symbolism. However, many of your global contemporaries like Noland and Stella turned to pure form to repudiate symbolism from their art. Can you share your thoughts on this difference? Well, it is symbolism in a way, but it is more a concentration on the significance of vital forms. You see, only symbolism or philosophy is not enough. Buddhi to hriday ki dasi hain [the mind is slave to the heart], said Mahatma Gandhi. Einstein has also said that the emotion is extremely important. You have to go beyond imagination. Kala ja akal ke aage ke noor, chirage rah hain manzil nahin [move beyond the mind and intelligence, it is only a path, not a destination], you have to go beyond intelligence. Now, you see, this has to be done and I have a feeling that only being an Indian or having an Indian passport is not enough. You have to 'know' - mano ke Shankar, na mano to kankar - if you believe in a symbol like the shivling [a sculpted representation of Shankar or Shiva in stone], it can be godly; if you do not believe, it is no more than a pebble. A stone can represent divine power, and it can also be just the visual representation of a stone! So the question of finding the immense power of symbolism in Indian culture is one thing. To be dedicated to it in a romantic way, is entirely a different thing. Now it depends who the artists are that are working in this direction, and what they are trying to show. You see for me, artists like Gaitonde and Jamini Roy are very important. Also Amrita Shergill, Ram Kumar, Krishen Khanna, and painters from Bengal, or Gujarat, or Madhya Pradesh who are working in the direction of 'significant form'. More than being only abstract or modern or symbolic or religious, it is important that there should be an integration of vital form and a mystic, emotional, divine perception of this universe, which is a very complex matter. Yes, you have mentioned a few times that this complexity also involves a "complete sensory experience" for the viewer. This involves the work of a sixth sense as well, given the importance you place on the 'soul' as a sensory organ. Can you tell us a little about this? I go to the Church in France because it is a Christian country. When I come to India I visit our temples, mandirs, and travel to the sources where Hinduism, Jainism, Buddhism emerged from. Mahavir is very important to me, Buddha is very important to me - I have a feeling that today we should come closer to human hearts and human sentiments, to shanti [peace] and to love, rather than hatred and violence. I think that the concept of vegetarian food, for instance, should develop more and more. God has given everything to humanity to subsist. Why kill birds and animals, who suffer when you do this. Now, you see, these are the ideas we have to not only believe in, but we have to practice. The majority of people still eat meat. We have to stop throwing bombs on cities and fighting with each other. We have to love each other and develop a sense of 'consideration'. It is possible. Ishwar Allah tere naam, ham sab ko sammatti de bhagvan [By whatever name you are called, God, give us all peace]! These are teachings which come from my country! We have to take them, and with a profound or deep understanding; not in a superficial manner.